Phillips was referring to John Howard, Australia’s prime minister at the time, ordering his nation’s cricket team to pull out of a scheduled tour of Zimbabwe, and even threatening to suspend the players’ passports if the sport’s governing body did not abide by his decision. At the time, Phillips had recently returned from a visit to Australia. Concerning her impressions of the political scene in the Antipodes, she made the observation, “Coming from Britain to Canberra to interview members of the Australian government is like leaving a fetid malarial swamp to be douched with fresh cold water from a mountain spring.” She praised these politicians for simply being “on-side in the great fight for civilization against barbarism” (Spectator, March 16, 2007). One would have to wonder what Ms. Phillips’s impressions would now be should she revisit Australia under its new center-left government. Australia’s Prime Minister Kevin Rudd lost little time in revealing his true political colors, and pink they proved to be. He immediately announced the withdrawal of Aussie troops from Iraq and followed that up by creating history in the Australian Parliament, having Aboriginals do a tribal dance on the floor of the House. He then gave a speech declaring on behalf of all Australians an apology for the way they had treated the indigenous people that populated the land at the time that Great Britain took possession of it, and their progeny down to this day. “Rudd is a sentimentalist who wants to say sorry regardless of the facts about the ‘stolen generations,’” Bolt wrote. “But I am a rationalist who can only say a sorry that respects the truth …” (Herald Sun, Feb. 8, 2008). What should be of even deeper concern to Australians is the method of government that is in process of imposing itself on the nation. It is a form of government starkly in contrast to that which Australia experienced during its decade of economic growth, of internal stability and external security, during the Howard prime ministership. Australia’s swing to the left in the national elections witnessed how few really appreciate that there is a strong link between traditional, conservative values and experiencing these blessings. When one reviews Australia’s brief political history since its federation as a Commonwealth in 1901, a cyclical pattern of swinging from left to right in regular rhythm over the past century is revealed. But through it all is threaded a degree of down-to-earth common sense that eventually bails the country out of local, statewide or even national disaster from time to time. Being largely of British stock, Aussies are known for producing their best when they are in the last ditch with their backs to the wall. That is the Anzac tradition, earned with honors in battle both in the desert of the Middle East and the mud of the Western Front during World War i. But the link to the Anzac tradition is now almost severed, as the generation that experienced that terrible war has all but died out. Australia is now governed by those who never knew the impact of world war nor suffered the privations of a global economic depression. Without such a test on national character, Australia is in danger of becoming soft—soft-headed in particular. The swing from right to left in the Australian electorate during the 2007 federal election was powerful. Polls in early 2008 gave Prime Minister Rudd a 70 percent support rating. But, considering the early indications, although Australia’s left-wing mass media did an extremely effective job of brainwashing the public into accepting a change of government, what is emerging is a form of government that they may well live to regret. Andrew Bolt is one of few who recognize the danger. “Rudd is building himself a model of soft-corporatism, in which political opposition will be muted and dissenters denied political (and, increasingly, even media) representation. This is a terrible mistake for the Liberals [Australia’s conservative party], and an erosion of democracy” (ibid., Feb. 14, 2008). Australia seemed to briefly enjoy a feel-good mood in the wake of the 2007 election. At least that’s how the mass media portrayed it. However, realists perceive that the timing of Mr. Rudd’s electoral success could present the new Australian government with a real problem. In an effort to fend off worries about Australia’s economy early on in its administration, “The Rudd government has declared Australia should be able to avoid recession despite high inflation and a slowing world economy” (ibid., Feb. 11, 2008). However, some see dangerous shoals ahead for an Australian economy that is so heavily geared to the commodities markets for income, drastically dependent on imports for consumer goods, and sports a currency that gives every indication of being significantly overpriced. To add to these concerns, Australians soon found out they were not immune to the spreading disease of financial failure courtesy of the U.S. subprime mortgage meltdown. “The American subprime virus has arrived in Australia,” said Jonathan Pain, chief investment strategist with hfa Asset Management. “In an age of globalization, no nation can be viewed in isolation” (Age, Feb. 24, 2008). “[A] wave of house repossessions,” reported the Age, “is now claiming about 800 homes every week around the country, because families can no longer afford their mortgage repayments. Now analysts are warning another 300,000 households are at risk …” (ibid.). But the subprime backwash is not the only challenge facing Australia’s government. The full cost-effect of implementing the Rudd government’s platform on a number of items in which it proposes sweeping changes to the Australian economy and social order has yet to be measured. As commentators for the Sydney Morning Herald put it following the 2007 election, “Rudd Labor has vanquished the second-most tenacious leader Australia has known, but a series of demons, dragons and other dangers await the victors as they arrive in their ministerial suites” (Dec. 1, 2007). The burning questions that so heavily impinge on Australia’s future at this juncture are these: Just what is the Australian identity today? What are the real values that Australians respect and seek to protect from the impact of creeping multiculturalism? What are the standards that underpin Australian society today? The realists worry about all this. As Melanie Phillips observed, “Throughout the West … [t]he political class is incapable of disinterested statesmanship because it is no longer sure in what—if anything—it still believes” (Daily Mail, May 13, 2007). Of Australia’s prime minister of the past decade, Phillips noted, “Mr. Howard, in sharp contrast, is entirely free of such absurd and crippling cultural cringe. He believes in Australia and its Western values. He thinks these values are superior to any alternatives. And it is this total absence of equivocation in upholding the national interest which explains his robust defense of both Australian identity and Western civilization against attack” (ibid.). 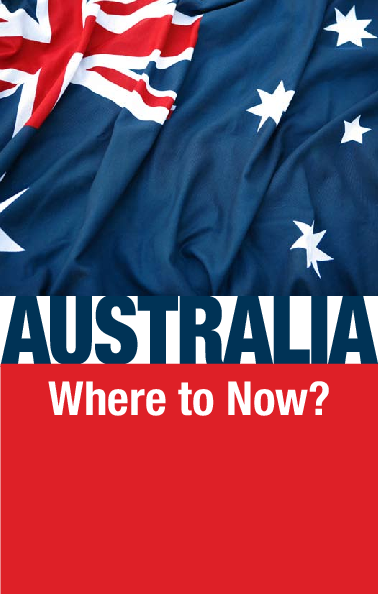 We simply pose this question: In this age of great global disruption, this age of immense challenges to Western civilization from contending cultures and great religious movements foreign to the West, does Australia—which under Mr. Howard stoically resisted incursions upon its foundational values, institutions and freedoms—now, under a different form of government, have what it takes to continue a robust defense of Australia’s true identity as a nation?